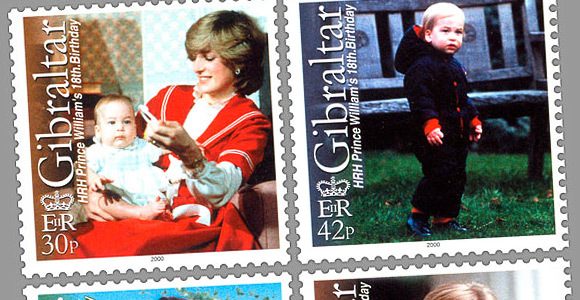 Prince William is the elder son of The Prince of Wales and Diana, Princess of Wales. He was born at 9.03pm on 21st June 1982, at St Mary's Hospital, Paddington, London. A bulletin announced that the Royal baby weighed 7lb 1 1/2oz. On 4th August 1982, Prince William Arthur Philip Louis was christened by the Archbishop of Canterbury, Dr Robert Runcie, in the Music Room at Buckingham Palace. After attending Mrs Mynors School, Prince William became a pupil at Wetherby School in London, from 15th January 1987 until 5th July 1990. From September 1990, The Prince attended Ludgrove School in Berkshire, for five years until 5th July 1995. He then attended Eton College from July 1995 and studied Geography, Biology and History of Art at A Level. Prince William was 15-years-old when Diana, Princess of Wales was killed in a car crash in Paris on 31st August 1997. Prince William and Prince Harry walked behind their mother's cortege at her funeral which was held at Westminster Abbey on 6th September 1997. After a gap year in which he visited Chile, Belize, worked on British dairy farms and visited countries in Africa, Prince William chose to study at St Andrews University in Fife, Scotland. He graduated with a 2:1 in Geography in 2005. After a period of work experience, Prince William joined the Royal Military Academy Sandhurst as an Officer Cadet. He was commissioned as an army officer in front of Her Majesty The Queen at Sandhurst in December 2006 and joined the Household Cavalry (Blues and Royals) as a Second Lieutenant. On St George's Day (23rd April 2008) The Queen appointed Prince William to be a Royal Knight Companion of the Most Noble Order of the Garter. Click here to read more. He was installed at The Annual Garter ceremony held at Windsor Castle. Although still a Lieutenant in the Household Cavalry, Prince William is now training to be a search and rescue Pilot with the Royal Air Force. Click here to read more about Prince William's military career. At the same time, Prince William is President or Patron to a number of charities and organisations whose work he wishes to support.